The first day back from vacation is always so hectic! Ogre and I had a meeting downtown mid afternoon, I had a patient to admit at the hospital, the kids needed to be picked up and Mina had Hula lessons -not to mention the unpacking, laundry and “pre cleaning” for the maid that still had to happen. I ended up going straight from the meeting to pick up the kids and took them both with me to the hospital while I did my admission, they colored at the nurses station and then I drove them both to Mina’s Hula lesson (where Benji was close to stepping on my last nerve) and then had Ogre meet us at Houlihan’s for dinner. Benji continued to be a pill initially during dinner. They got crayons and a coloring page, but Benji was angry at me for not understanding what he wanted me to do with his crayon. He ended up throwing it across the table onto the floor and was more angry at my refusal to get his crayon. 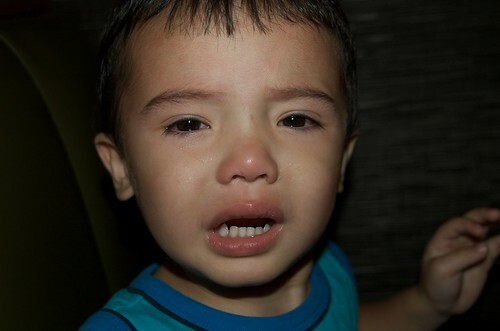 I told him he shouldn’t have thrown the crayon so I wasn’t going to get it for him. 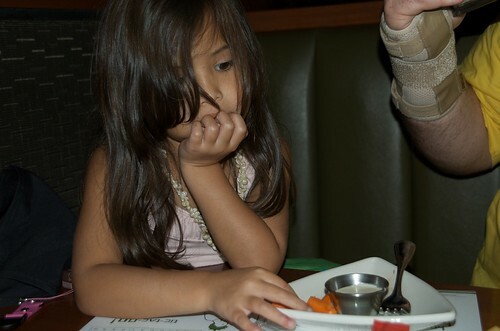 Our waiter tried to appease the kids by offering up the carrot appetizers for them right away. He got our drink order and appetizer order and came back with the carrots. Benji was only happy for a millisecond. He ended up crawling under the table to get his crayon himself and after that seemed to calm down. 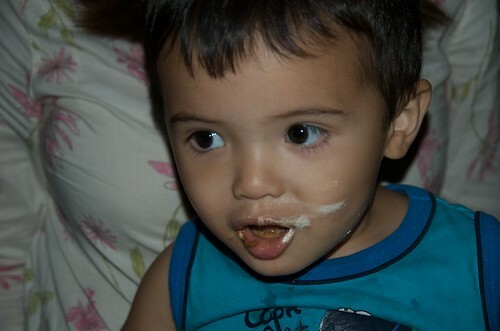 Once we got the appetizer, Benji’s mood improved significantly and my sweet boy was back to join us for dinner. 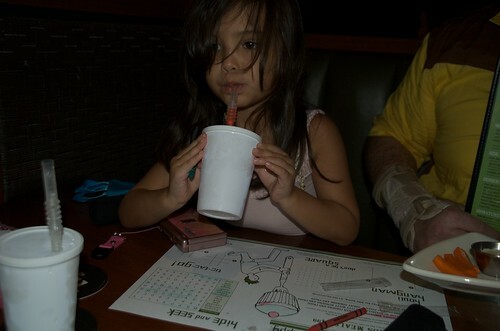 Mina was busy playing with her Nintendo DS that Papa brought for her…when Papa wasn’t playing it. We told her she needed to finish her plate of carrots, which she was not thrilled about. By telling her she could not have a second piece of tuna until she finished the carrots, we did not have to prod her along too much. She and Papa also played that box game again, but they never finished because the game was on too large of a scale and Mina refused to let Papa cross off some of the boxes. Our dinner arrived and the kids were very good about eating dinner. We didn’t have any more problems at dinner, which I was thankful for because the baby wanted to dessert!! We discussed our options, but Mina was pretty adamant that she wanted the chocolate fondue dessert. Fine by us. 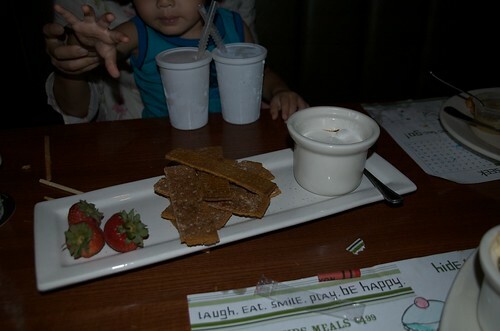 We loved that chocolate fondue dessert. The kids ate all the strawberries, but I (and the baby) was content to just eat the chocolate sauce with spoonfuls of Benji’s ice cream. We ordered the Seared Rare Tuna Wontons. Not quite what I expected, but very tasty nonetheless. So, the tuna is seared and has a nice crust to it, but is not served with won-tons. There is one large won-ton with some pico like dressing atop it as you can see from the picture. The tuna is atop some drizzled soy ginger sauce and a wasabi sauce. Tasted great!! I will try their seared tuna salad the next time we come because of this! I ordered the French Onion Soup and the Lettuce Wraps as my dinner. The French Onion Soup was great…definitely above average. It had a very bold flavor and was very hearty. The Lettuce Wraps were also pretty good. Ogre thought they were better than PF Chang’s, but I think I like them a little better at PF Chang’s. They were a little more on the salty side here and I did not like that so much. It did come with a very good Sesame sauce to pour over the wraps. Ogre ordered the Buffalo Bleu Salad, which is a salad with breaded chicken dipped in buffalo wing sauce. The salad also had Gorgonzola cheese, pecans, bacon and cheese. He thought the salad was really good, but thought he’d ask for extra buffalo sauce if he ever ordered this again. The kids had a corn dog and macaroni and cheese (2 different kids meals) each came with applesauce and the corn dog came with fries also. They both liked it and there was no food left behind! Oh, it also comes with a carrot appetizer and ice cream for dessert. The whole family shared the Chocolate Smores Dessert, which was served with a bowl of chocolate sauce topped with marshmallow cream aside some graham crackers and strawberries. Excellent. Overall, pretty good. He lost a few brownie points at the end as he disappeared for quite some time after he dropped off dessert. He was otherwise, very friendly, very informative and seemed eager to please. The food came out at a pretty good tempo. Definitely kid friendly. Kids activities/crayons, kids menu items. Laid back restaurant. This restaurant reminds me of a more laid back, more inexpensive Houston’s alternative. We will definitely eat here again as there are other dishes Ogre and I want to try and the kids seemed pretty well entertained and happy. Next time you go, try the Asian Chop Chop salad…and also the stuffed mushrooms are very good. They do a reverse happy hour as well..1/2 off apps and drinks. The only thing I haven’t liked here are the nachos….hate greasy floppy chips. Sometimes a good solution is carving out time for your child to spend on fun and structured activities. for good options, if you are an enthusiast of urban treks. for these beautiful animals. Each camper has behind-the-wheel time in both the mini-cup cars and the rally off-road rally karts during the week. just two years ago seemed completely outrageous and a major stretch’a half marathon of 13.
camp training will do you good. toilet handle, the flapper rises and allows the water in the tank to empty into the toilet. Crabs Before cooking, rinse crabs in freshwater, making sure they are all alive. Some of the popular cosmetic surgery procedures – notably the head lift – are popular attributable to aging skin circumstances accelerated by experience of the sun. Vanity is when you have something taken care of because you want everyone to notice and look at you. site, it contains importnt Information. To play 8 ball pool cheats the computer that is being developed. Since no two people can share a same taste thus fashion also varies according to a person’s taste. I visit every day some sites and websites to read posts, but this website presents quality based posts.